About the Exhibition: Get ready to see ancient Greece in a new light. When most of us imagine ancient Greece, visions of the Acropolis in Athens or a sun drenched Greek Island probably come to mind. But the Getty’s new exhibition gives us ample reason to consider another Mediterranean island as well, Sicily. In the fifth century B.C., Greek colonists flourished on the island of Sicily and created one of the ancient world’s most remarkable centers for cultural innovation. 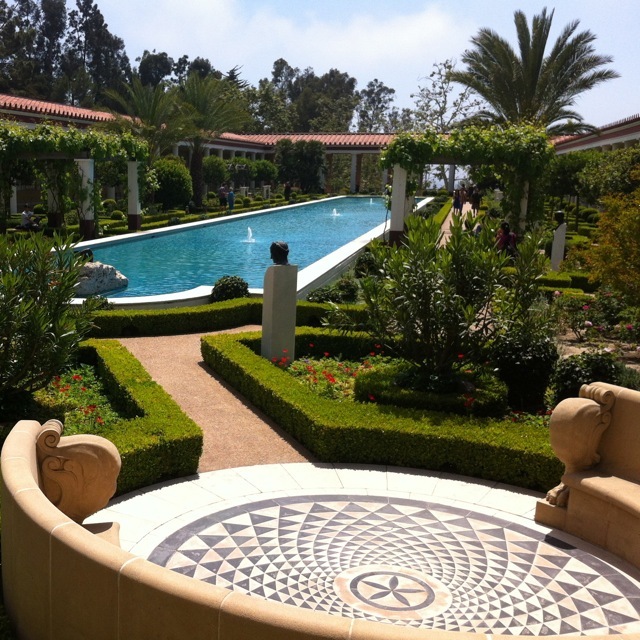 Now we have a chance to see 150 treasured objects from this extraordinary moment in time in Sicily: Art and Invention between Greece and Rome, on view at the Getty Villa Museum from April 3 through August 19, 2013. A Kid’s View: I saw the Sicily exhibition at a preview event and couldn’t wait to show it to my sons, ages 9 & 11 years. The first object we encountered was the exhibition’s centerpiece, The Mozia Charioteer (below) — one of the greatest remaining masterpieces of ancient Greek art. Experts believe the sculpture represents an athlete who competed in the chariot races at Olympia. My oldest son described his triumphant expression and stance as “swag.” You have to see the sculpture in person to appreciate how the artist literally brought stone to life — the muscular figure is so lifelike it’s chilling. My children are huge sports enthusiasts so the athletic theme of chariot races really fired their imagination. They discovered images of four horse chariot races on several objects in the first gallery including a marble relief, and a large prize vessel (these jars were filled with olive oil and presented to victorious athletes). They even found a life-size marble carving of a horse’s tail. I always assume the bigger, the better, when it comes to engaging children in works of art. But the exhibition’s 50 rare coins totally refute that theory. Both children marveled at the intricately rendered portraits of Greek mythological beings on the coins like Herakles, Persephone, and Pegasus. 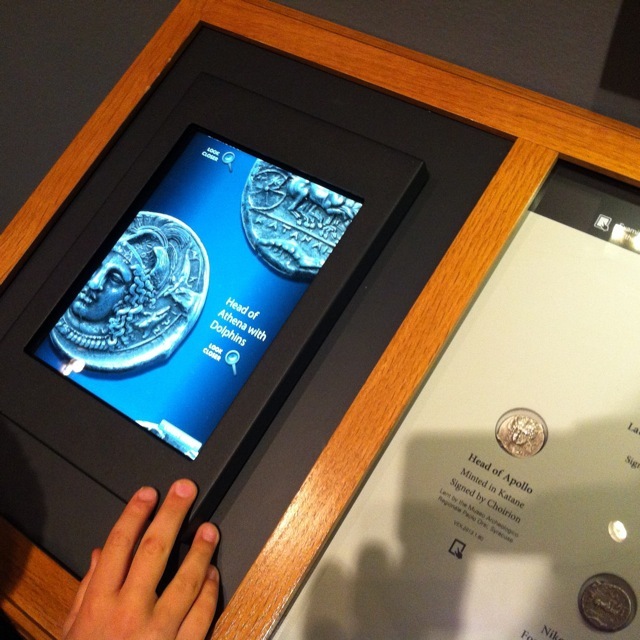 The coin installation iPad screens were a total hit with my 9 year old son. 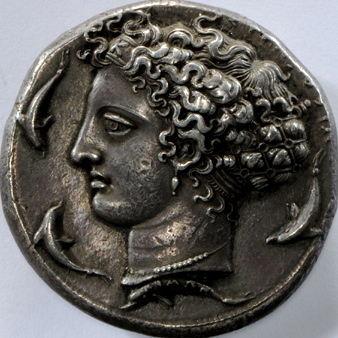 He used the iPads to zoom-in on the coins’ fine details like dolphins swimming around a portrait of Arethousa, a nymph who could transform from human form to water (below). My 11 year old, on the other hand, gravitated toward an old-school magnifying glass to find the tiny signatures of the Sicilian master engravers on the coins. Low display cases like the one below make this exhibition especially kid-friendly. Nearby, a father with two teenage sons used magnifying glasses to get a close-up look at a coin with a portrait of Zeus seated at his throne — this coin is one of the most precious ancient coins in the world known as the “coin of coins.” You’ll find it in a separate case in the middle of the gallery. Next, we stopped to look at an inscribed bronze helmet. One of the family highlights recommended to me by Claire Lyons, the exhibition’s senior curator. When I told my children it was worn by an Etruscan warrior in a real battle, all my youngest could say was “Whoa!” After the battle, a Greek king inscribed the helmet and offered it to the gods to thank them for a great victory. We spent most of our visit in the first gallery, which was more than enough for my 9 year old. There’s so much more to see next time. The Sicily exhibition is filled with ancient artifacts sure to captivate all ages: a solid gold ritual dish that weighs 2 ½ pounds (above), a bronze statuette of Herakles wearing his signature lion’s skin, and a large Cyclops head sculpture (another one of curator Claire Lyon’s family picks). 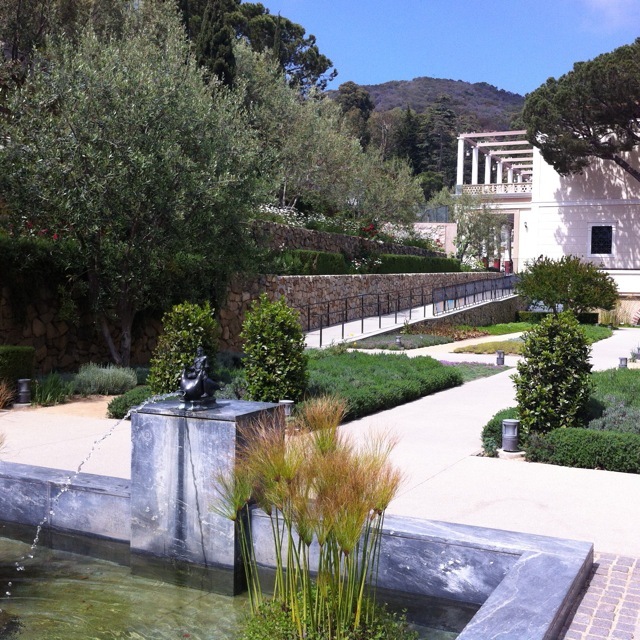 After we left the galleries, we headed for the Villa’s Herb Garden (above). 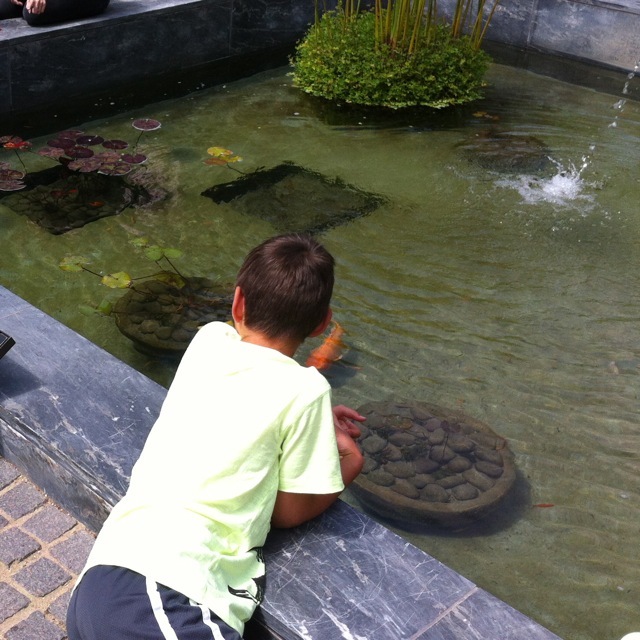 We lingered at the pond’s fountain for a long time watching the Koi fish swim in and out of the water lilies. Images of ancient Sicily and Greek mythology filled our heads. Wait, did we just see Arethousa? More on Greek Myths: Want to learn more about the mythological tales of the heroes, heroines, and creatures portrayed in the exhibition’s objects? Then check out the Museum Store. The children’s section has lots of great books about Greek mythology. 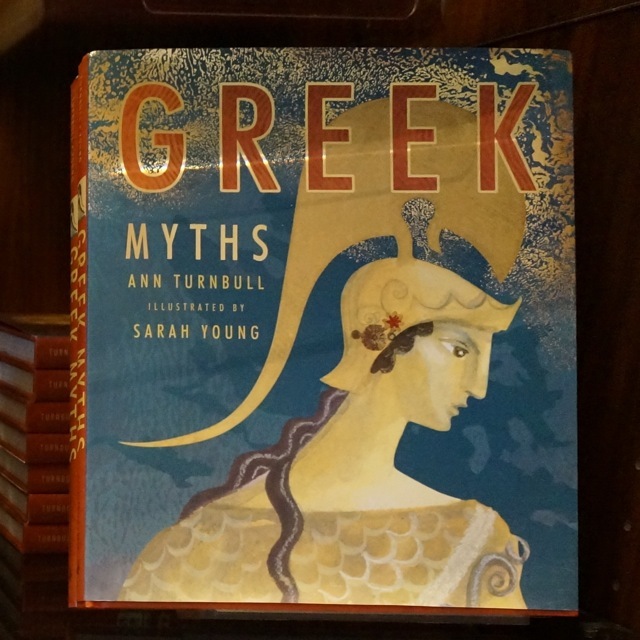 After our visit, we purchased Ann Turnbull’s beautifully written and illustrated book Greek Myths (below) and it’s become our favorite bedtime reading. 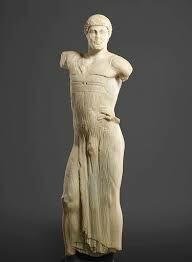 Statue of a Youth (The Mozia Charioteer), Sikeliote (Sicilian Greek), 470-460 B.C. Courtesy of the Servizio Parco archeologico e ambientale presso le isole dello Stagnone e delle aree archeologiche di Marsala e dei Comuni limitrofi—Museo Archeologico Baglio Anselmi. Coin with Head of Arethousa, Sikeliote (Sicilian Greek) minted in Syracuse, 405-400 B.C. Courtesy of and © Royal Library of Belgium. 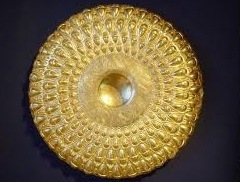 Phiale Mesomphalos (Offering Dish), Sikeliote (Sicilian Greek), 325-275 B.C. Courtesy of the Antiquarium di Himera.